Adam Lambert to Guest DJ for Ellen on Tuesday! 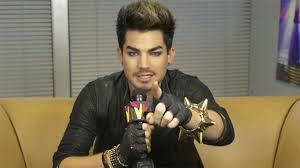 You are here: Home / More Featured Posts / Adam Lambert to Guest DJ for Ellen on Tuesday! We heard straight from Adam’s tweet that he will be on Ellen sometime this week. I just found out it’s Tuesday, November 5th! I don’t really have any more to add to this other than to let you know that Adam will be Ellen’s guest DJ. Be sure and tune in and hope for some spicy interaction between Adam and Ellen!